I received a make your own beer kit for Christmas from my son, and my daughter gave me the bottles. Although I'm not much of a beer drinker, I was always interested in the process of beer making, especially in the home. So we started mixing and brewing in early January and this weekend, after many steps and a lot of waiting, opened our first bottle of West Coast Pale Ale. Much to my and everyone else's surprise, it tasted great! 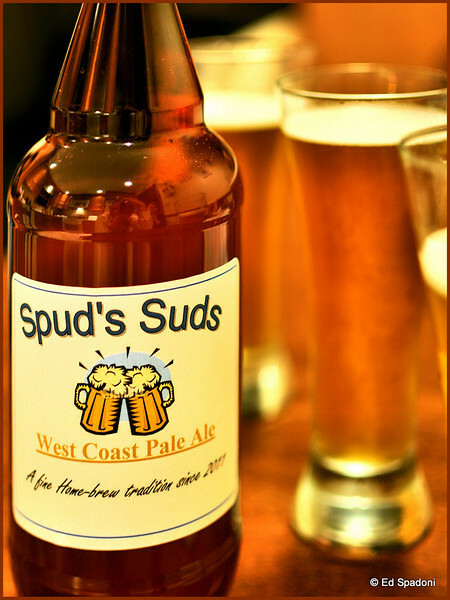 I couldn't resist labeling it in a personal way, and if you look closely, you can see Spud in the suds! Fun shot Ed, beautiful golden tones and great label! Excellent composition, Ed. And congratulations on your successful brewery project. :) Thanks a lot for the information that you sent me. I took a quick look through the links but plan to do so in more detail just as soon as I can find some free time. I know of one of the photographers featured in the magazine, Ian Cameron. He produces incredible images. Mmmmm, mmmmm. Hoppy or malty? Cheers to you. Nice image, beautifully composed and the golden tones are really nice. How fun! Beautiful amber tones and fantastic label and set-up. Great shot. Makes me think it's getting close to it being green. What a fun shot -- looks delicious! OW Ed, that's not easy, I'm very impressed. Love this shot and love that label!